Maybe there are some happy-go-lucky entrepreneurs who do not feel overwhelming guilt and shame for at least a part of each day in their business, but I haven’t talked to them yet. Owning a small business means that you are the final word, the final line of defense against chaos and madness all around you. 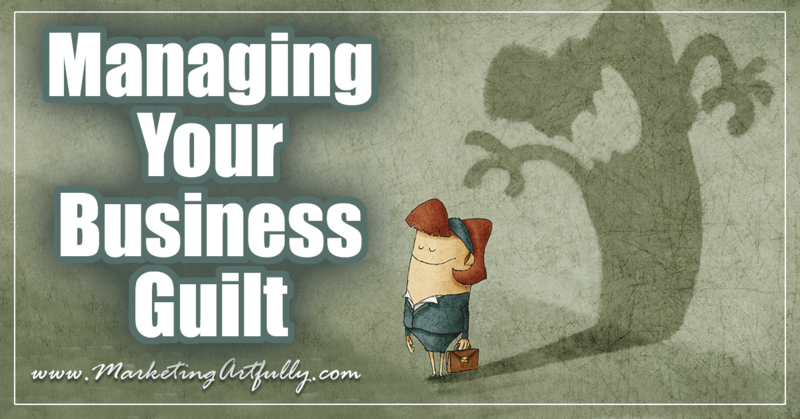 Whether you are managing a team or working alone, there are many moving part to your business, and I have found that most of us spend a good part of our day feeling guilty about something or other! Here are some things that come to mind…. ALL of these have come up to me during the last month of talking to business owners! It seems that no matter how much or how little we are working, there is some measure of guilt all the time. I see funny little memes all the time from my Realtor friends who are saying that they were going to take time off, but they got a call so they are heading out the door back to work. The memes are only funny because they are true. Realtors are the WORST at taking time off, but so are many others of my peeps. There is a saying, “Never off, never on”. If you never take time to charge your batteries, you cannot be performing at the top of your game! To Do: Put all the things you have to do in your weekly calendar. Kids, appointments, meetings. Then put in some personal time off. I don’t mean when you are going to an all day volleyball tournament for your kid, I mean YOU TIME. Even if it is an hour to start, carve out some me time. Now stop… and put in BUSINESS time off. You determine how much, but I for sure do better when I have at least a half a day when I have SCHEDULED dinking around. I could spend that time shopping for my vintage store, going to Starbucks and planning or even taking a course so I can learn something new. Don’t apologize to anyone (including yourself) for this time and treat it as importantly as you would a meeting with your best client! I am FAMOUS for wanting to do all the things but that is a recipe for guilt disaster! No one could ever do all the things that they would want in their business so you have figure out what is realistic to physically accomplish in the time you have. I KNOW Grant Cardone says to 10X everything and I am a fan of that for sure! But you can’t 10X your media kit, product pictures, Pinterest, Instagram, blog, email, videos, etc. all at once. Yes, that is my list things that I am wanting to fix in my business but KNOW that I have work on one or two at a time, not all of them at once or none will really get better. To Do: Pick two or three things each month to focus on. My mastermind partner, Kirsten, and I meet each month. We talk about our 1 year goals and then pick two or three things to focus in the coming month that moves us towards one of those goals. This month my goals are to 1) write a blog post a day, 2) take a picture a day and 3) start collecting content for an upcoming ebook. That is it. Does that mean I don’t have to do other things, heck no, but the only things I HAVE to do for my business to be successful this month are those three things. I am not allowed to feel guilt if I don’t fix my email list or don’t do Tailwind every day… they are not one of the three things! Some of my peeps are super sad if they don’t answer every customer question in under an hour, have email inbox 0, respond to every mention on Facebook, answer every phone call (even while driving), etc. Part of this problem is how you have structured your business and what kinds of expectations you have set for your customers or clients. As a business owner you do not have to work 24/7 so that means from time to time you will not be able to get back to people as quickly as you might like, but that is okay if they know the “rules”. My customers know that they can send me things to do all week, but I am only going to work on them on Monday. That is the day I do client work. Does that make them sad, maybe a little bit but it makes them sadder when I say I will do something and don’t get it done because my week was already crazy busy and I couldn’t get it squeezed in anyways. AND I don’t have to have daily guilt about not doing the work! To Do: Set up systems and let your peeps know. You can do this same kind of thing. Put in your shop policies or on your Contact Us page that you answer most enquiries by the next business day. This eliminates some of those weird, they called at 8PM on Friday night and you are feeling guilty all weekend. The next business day is Monday so they should not expect a call back before then. Use anything at your disposal to make this easier! Put an autoresponder on your email reiterating that you will get back with them by the next business day (or within 24 hours if you insist). Use auto-fill messages that you can save and “respond” by letting them know they will get a “real” answer in a wee bit. A cool suggestion that I heard a while ago was to have an “emergency text” message that says…. “If this is a business emergency I can be reached through my husband’s/wife’s cell phone. Text your problem to 555-1212 and I will get back to you as soon as possible.” Something that seemed super important gets less urgent when they realize they will have to “bother” your loved ones to get to you. This one is REALLY weird and gets me at least a couple of time a year. I LOVE writing blog posts but sometimes feel like I am pushing that to the end of the list of things that I “have/get” to do today. For a while there I had all kinds of excuses that I didn’t have time write blog posts because I had client work or had to list some products or I had to check Facebook. But none of that makes me as happy as writing blog posts and blog posts are how I find new customers and make money…sigh. To Do: Figure out three things you love doing in your business and make them a guilt free priority. I know a writer who DOES love Facebook and gets a lot of opportunities from talking to people there. Her time is not wasted spent there so she could put that on her list of three main things for her business. For her it is NOT goofing off and should be on her list of “must dos”. If you are a product seller, doing research of the market and product development should be a focus, you cannot feel guilt if you are cruising around the internet checking trends and looking for inspiration! Guilt goes away when you have stated your favorite things and have a rock solid plan for how to do them effectively! There are a million responsibilities and cool things you can take on that are actually someone else’s priorities. I get emails every day of people who would like to connect and have me share their new software or work on their projects, but I HAVE to guard my time religiously! Once you know your goals and expectations you can be super clear about what you should say yes to and what you can politely decline. For example, yesterday 1) a really nice lady invited me to go to a marketing training in Tampa next Wednesday night and 2) another friend invited me to be on her podcast for writers. Leaving my home and going to Tampa doesn’t make me happy and since I wouldn’t be presenting doesn’t offer that much opportunity to my business. Talking to my other friend for 30 minutes from the comfort of my office to writers (who are one of my niches) is a good opportunity for me. To Do: REALLY look at what other people are asking you to do for/with them and see if it will make you happy or improve your business. Stopping saying yes doesn’t mean NEVER saying yes, it just means that you have to be thoughtful about what you say yes to! I KNOW there is real guilt when you tell someone no, you can’t help them, but there is even more guilt when you are “wasting time” helping someone else grow their business instead of focusing on your own! It feels really selfish to make yourself a priority, but you only get one shot at this life so make sure you are spending it doing things that are important to you! 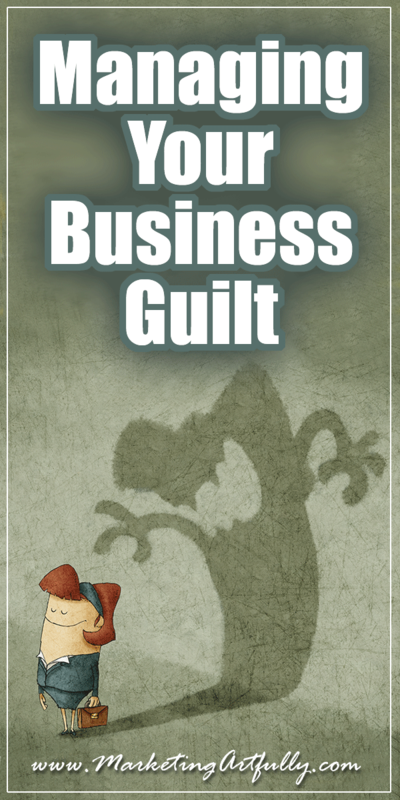 It is really easy to spiral into business guilt ALL THE TIME. If you are reading this you probably are feeling at least a little bit guilt about something or other. One thing that I have found helps is to write down what you are feeling guilty about or say it out loud to someone else. When you get it out of your head and into the world sometimes it looks worse and sometimes it looks silly. If it sounds silly saying you feel guilty, then just stop! If it sounds worse saying it out loud then make a plan about how to fix whatever you are feeling guilty about. And remember, it is just business! The world will go on and what feels so horrible today will be just a blip on the grand scheme of your life!